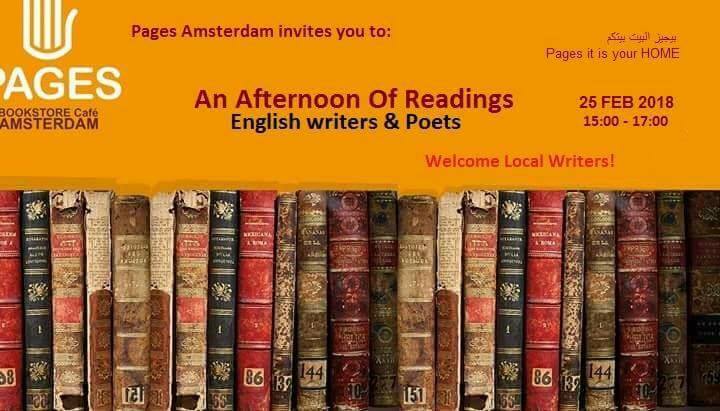 Back by popular demand, the Amsterdam English-language writing community gathers again for an afternoon of readings. Last time, we had a larger than expected turn out on a rainy Dutch day. You heard stories about falling in love with Iran, flubbing a stand-up comedy act and missing a train at Shambala Junction. There was poetry about England, South African and Old Virginny. We had fun. This time, we have a whole new line-up of local writers for you. Established poets, newbie novelists and everything in between. You’ll hear published works as well as some sneak previews of work in progress. Readings like this offer a tremendous morale boost to writers. But we also want to support our host, Pages Bookstore and Cafe. Our common cause is to foster ties across borders and languages to keep culture, everywhere, alive. Last but not least: support local writers by buying their books! Any writer attending this event, whether or not you get up on stage, is welcome to bring their own books for sale at this event.